The Saxons were here and the Romans had temples close by - but it was the Normans and their successors who established the town as we know it today. Shakespeare was still alive when Steyning's Grammar School was founded. It has survived. The railway, though, which served us for 100 years, has gone. 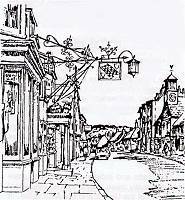 The crafts and industries of Steyning have traditionally been linked to the agricultural wealth of the Downs and the Adur valley. It has also however been home to many people with interests and involvement in the arts. We are interested in helping in every way possible with the requirements of the National Curriculum and other courses of study. The Museum is a resource which can add depth and interest to a student's work so please ring us for information if you feel that we could be of service. Next to the library in the centre of Steyning.